The starting point is the data presented to the individual. This consists both of empirically observed phenomena and of representations of truth made by others. There is an internal dynamic here. For instance, a person who has been reading a lot about global warming might be prejudiced towards interpreting an unusually hot summer in their part of the world as evidence for that trend. This is partly captured in the two-way arrow with group consensus, but it is also a matter of internal cognition. This is not a comprehensive listing, but it gives an idea of the kind of mechanisms within a single person that are at work when forming opinions. The link from personal opinions to personal choices is not a simple linear one. A second category of heuristics exist that do not determine what is considered true. Instead, they determine which opinions are important; specifically, they determine which opinions are important enough to deserve action. Two major types of personal choices are represented in this model. Those in the box ‘personal choices’ could be called direct actions. This would include something like buying a hybrid car or boycotting a company. 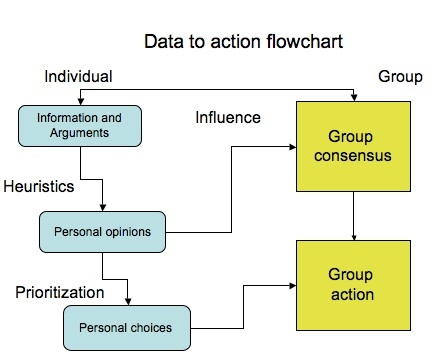 Within the arrow between personal opinions and group consensus lies the other kind of action: namely advocacy actions, in which an individual tries to convince other individuals or groups to adopt the same position the original individual has already reached. That feeds into the “information and arguments” boxes for other people, as well as contributing to the group phenomenon of consensus. Group action is thus both the sum of personal choices, and the product of public deliberation leading to institutional or societal choices. Here again, a process of prioritization takes place. An adapted version of this diagram could be constructed for scientists and for non-scientists. The biggest difference would be that scientists can engage in a broader project of empirical examination, thus contributing in a different way to the information and arguments being presented to others. They may well also employ different kinds of heuristics, when forming personal choices. Malnes, Raino. “Imperfect Science.” Global Environmental Politics. Vol. 6. No. 3. August 2006. pp. 58-71. Very snazzy chart. Definitely fit for inclusion. Here is a funny alternative flowchart. According to this article, “Mistaken eyewitness identification is the leading cause of wrongful convictions.” Given what I’ve been reading recently about memory and the brain, this does not surprise me at all.